Another game of CanCon, this time Battle for the Pass and ... another Dwarven army to fight against :) This time I had a great pleasure to play against Jason and his great looking army. Playing against a defensive force in the battle for the pass is always a challenge. 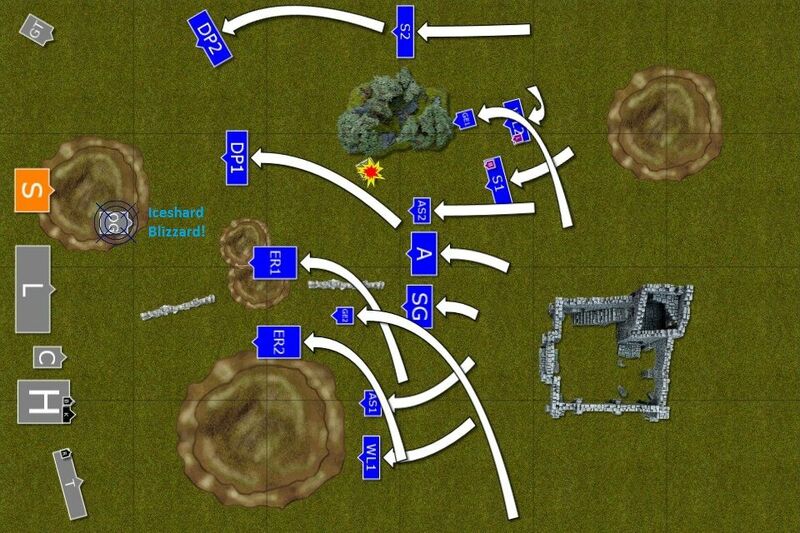 First, the distance usually is greater than in the normal Battle line scenario. 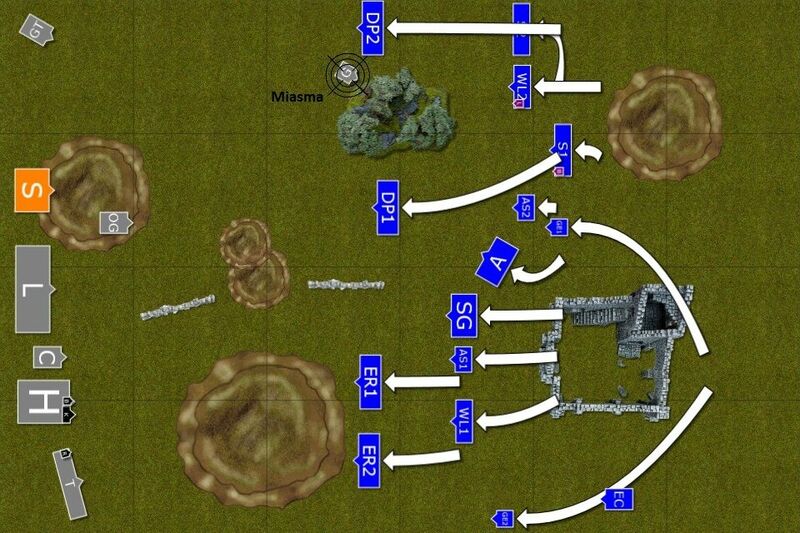 Second, such armies tend to sport some good shooting units and that means that whatever makes to the other side of the pass might not be of any significant combat value. 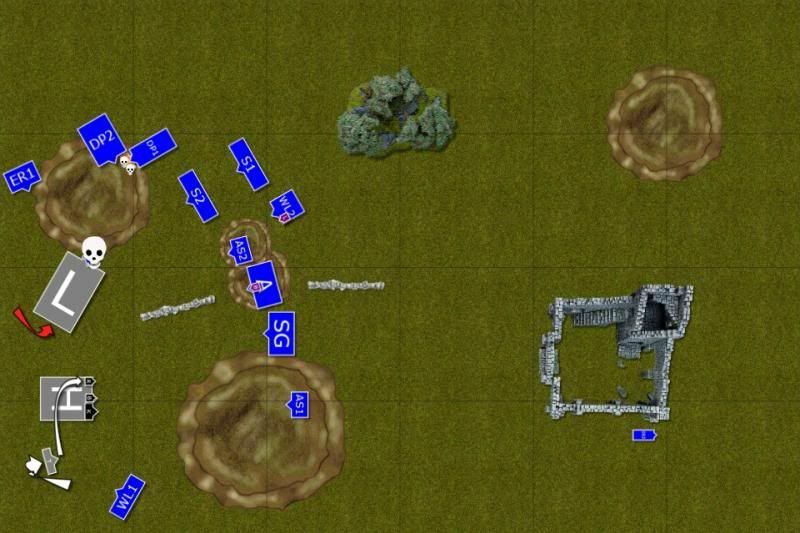 And third, narrower frontage meant it was way harder for me to outflank the enemy. Technically, one could play defensively too and simply stay put. 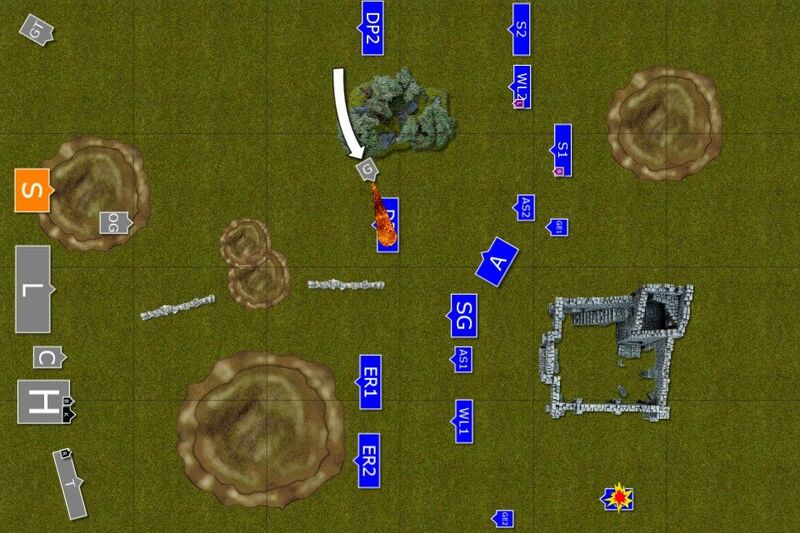 Some of the shooting elements do not have that long range and these that do may not be sufficient to kill enough of your forces to get many victory points on their own. Of course there are exceptions. But that would have made for a dull and boring game. As you could have already noticed from the picture above, Jason's army was not gunline type that gave me some hope. Unfortunately, I don't have the copy of Jason's list so I cannot tell you what else did he have but we can assume he was hard to kill. His presence made tough unit of Hammerers even tougher. 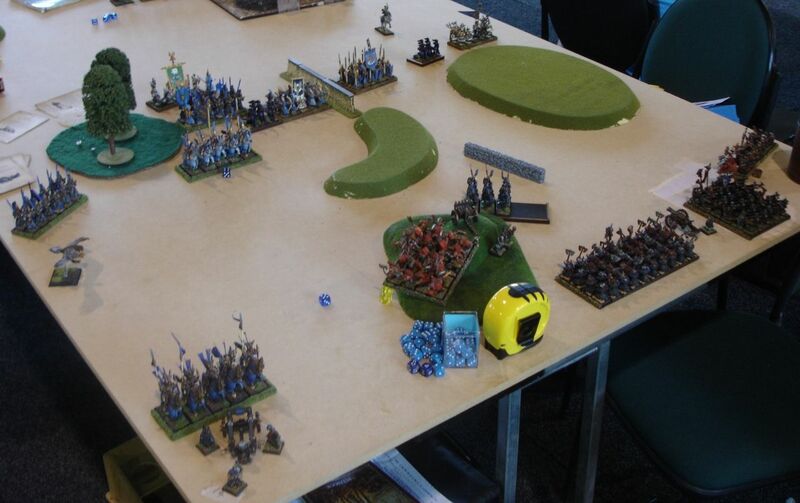 I don't have tools in my army that can open that Dwarven can quickly and with Hammerers as bodyguards I had slim chances to survive such encounter in one-on-one combats. But that is never an option. Basically, very good leader, very well protected too. Last time I played against 3 runes of spellbreaking! :) It was always very annoying that Dwarves could use the whole library of scrolls. Well, it was never going to be easy to get some spells through, so I was not complaining! Again, apologies for lack of details. I believe he simply had some protective gear. 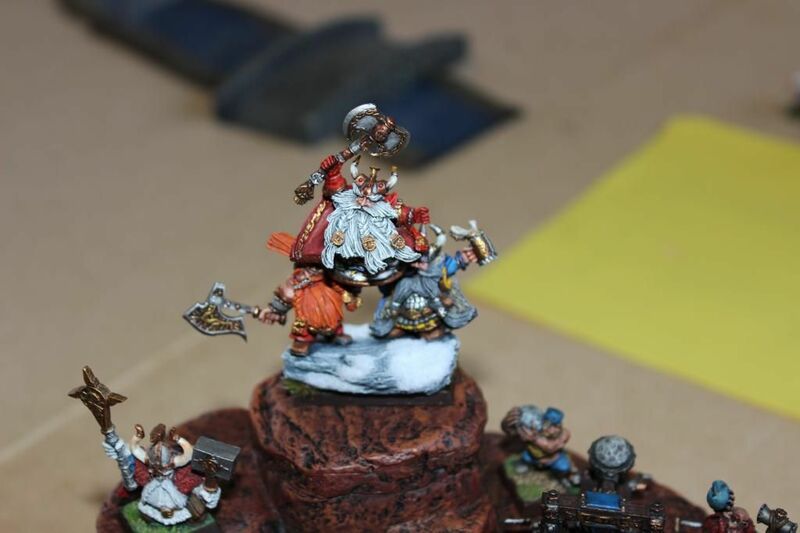 BSB is a must in many armies and Dwarves need one too. Ld9-10 is great but re-rolls make it excellent! I need to check if Swedish comp FAQ allows Dwarves to field them without warriors or maybe I simply messed up something. But I di believe these were Lonbeards. Even if they were regular Dwarves with great weapons, a horde of them would not go down easily. It is true I could fit in many more units against such a broad frontage and if I could close in early enough maybe I would have risked that. But that block can definitely take damage and hit back hard. Second combat block in the army. These guys had to be killed to a Dwarf more often than not. I have tools to defeat them but if I were I need to ignore and divert the other units. Even then it would take several turns and cost me dearly. 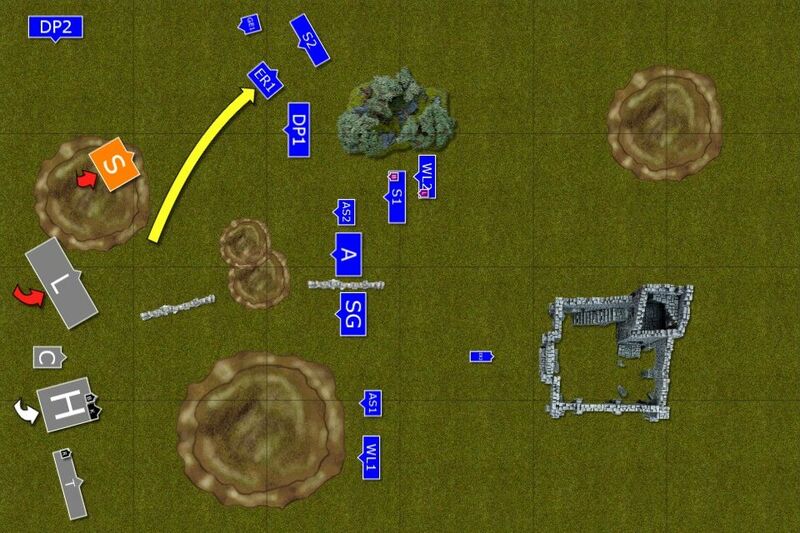 In the battle for the pass it would mean very difficult task to accomplish due to larger distance and less space to set up flank charges. Quite unusual to see them in such numbers in a single unit. Definitely a good target for bows, as usually Dwarves are way to tough to harm with S3 chop sticks. They would go nowhere no matter what and that means they have a chance to significantly slow down the advance. Even better in the battle for the pass. Very good shooters, especially for the defensive force when they don't have to chase the enemy, as the enemy comes to them. Relatively well protected against low S missiles. 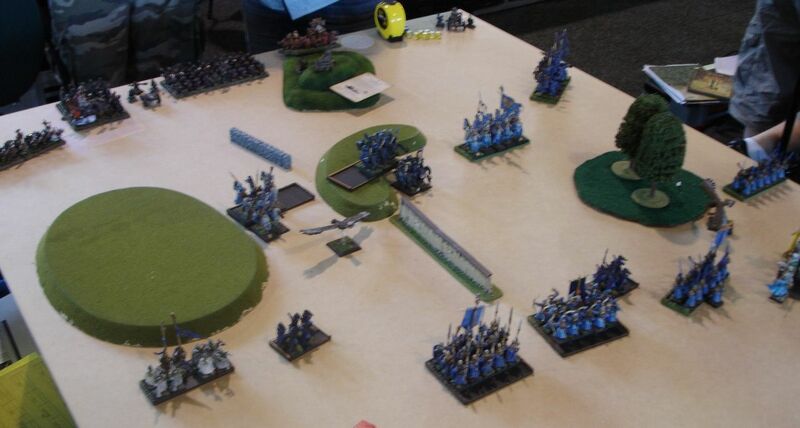 Might harm fast troops as eagles or reavers do not have many wounds to keep them safe from the shooting. One of each of the deadly war machines. Organ Gun is always target number one for me but its short range allowed for some manoeuvres while being safe. 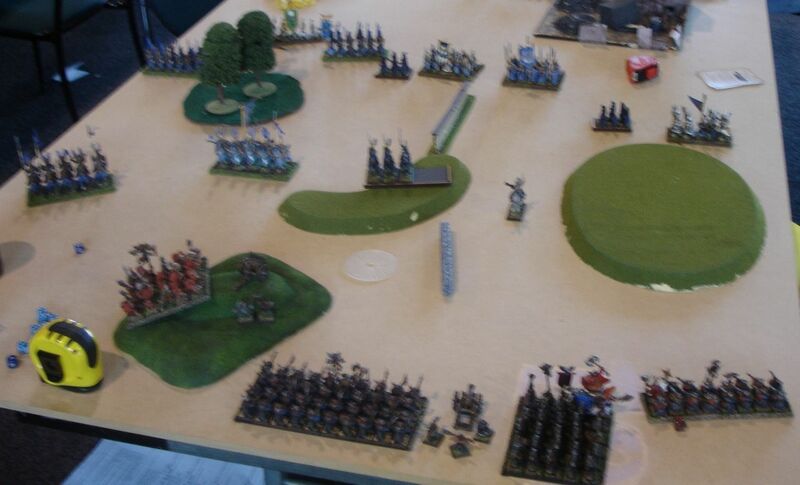 But it had to be dealt with quickly if I wanted to have time to attack other units. 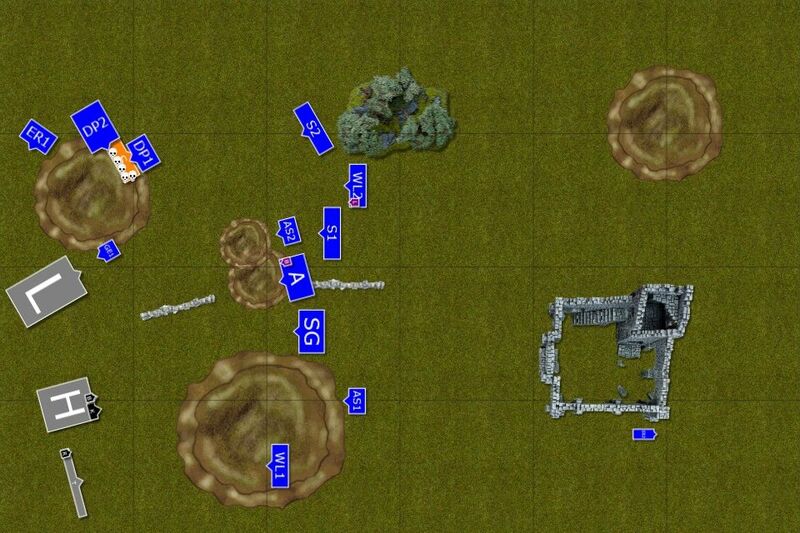 Cannon is less of a problem against my army but poor eagles have to use cover for sure. Grudge Thrower is much more dangerous as the template can easily cover whole units and with good rolls, can exterminate them entirely. Very annoying flier. Tough and well armoured, can expose itself to shooting and still emerge intact. Its steam cannon can be quite dangerous to my small units as well so I had to try and eliminate it quickly in order to be able to manoeuvre freely. I expected Jason to deploy tight in one corner with war machines nicely protected from the shooting and from the direct attacks. The good things was that his army had significantly lower comp (I think we had 3 points difference) so I simply had to be careful not to do something stupid, keep up the pressure and look for openings to get some of his weaker regiments. First, I wanted to deal with gyrocopter then with organ gun. With these two threats I could move freely and try to set up some charges, hopefully with enough time to do so. I was surprised to see the Dwarven army spread a little and war machines exposed. I wanted to use that to my advantage. Archers would start shooting the organ gun as soon as possible. Some target saturation would also be in order. 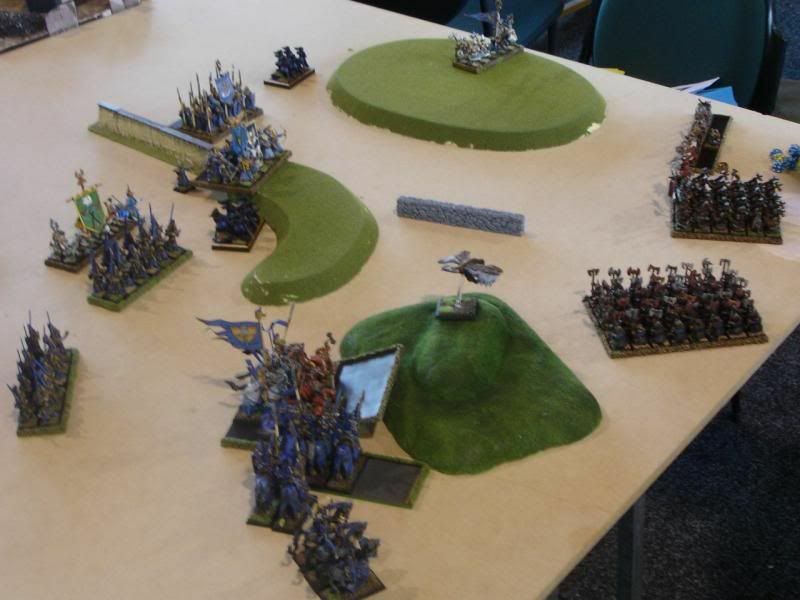 Hills, although low, would provide some hard cover from the Thunderers. Lone grudge thrower was also good news as I could get there with my cavalry. Last but not least, the gyrocopter also was too far ahead of the main forces and I could form double line to catch it. 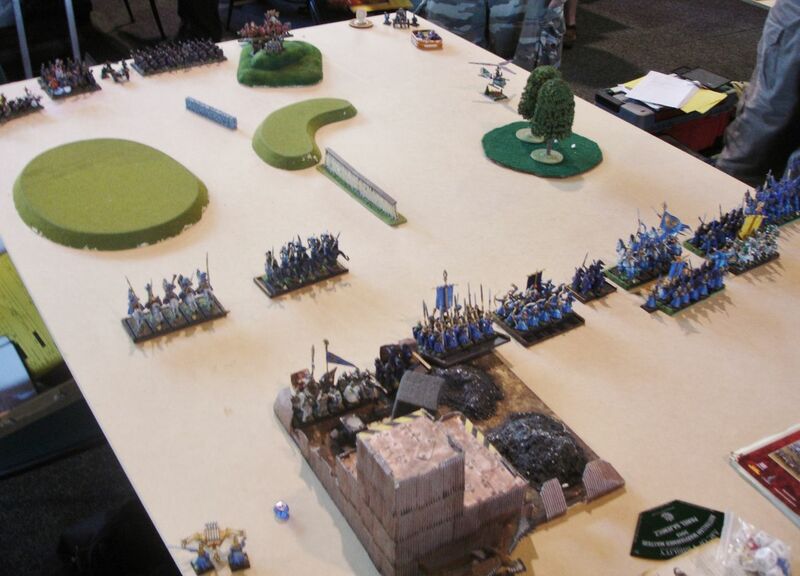 Cavalry would move fast forward while infantry would move behind them. That would deny safe landing zones behind the cavalry and if it wanted to fly back towards its own likes I could send some cavalry after it. We rolled off for the first turn and there were no surprises here as Jason won that easily. No need to rush, they will come! Dwarves had a very nice position and there was no need to hurry as they knew Elves would come anyway. Some of the Longbears opened flasks with something that aided their already grumpy mood, others smoked some pipes, while others simply did what Longbeards do the best - grumbled. 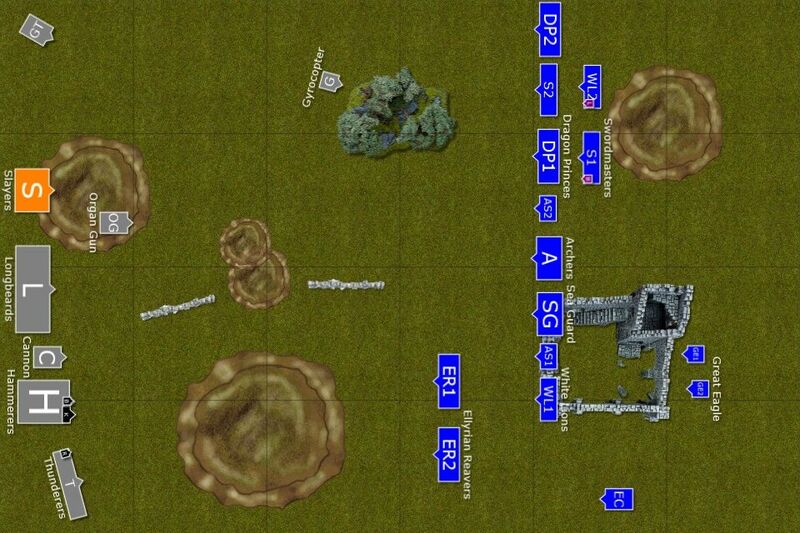 The artillery crews had plenty to choose from in terms of targets but could not hit much yet. Elves move at a double! Who can reach the Dwarven lines first? 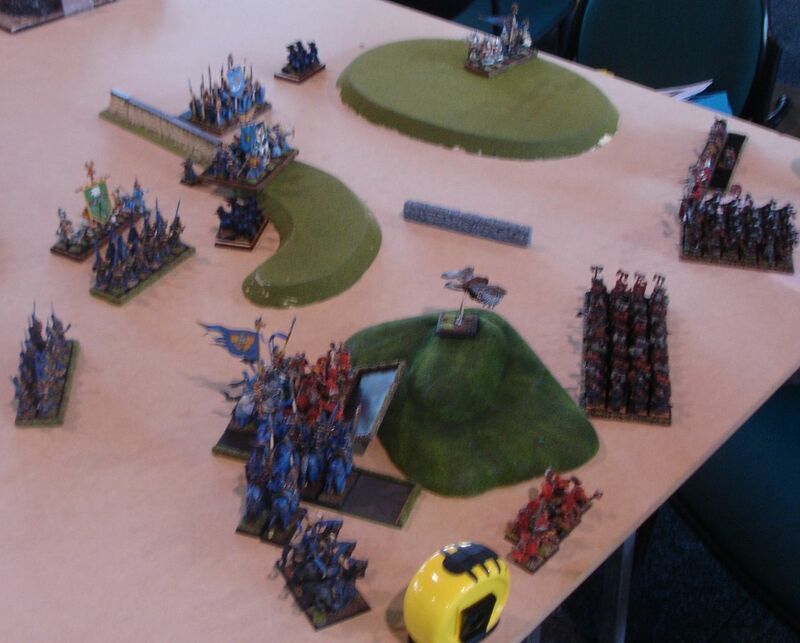 With Dwarven army standing still at the end of the pass, Elves had no other option but to move forward at a double. However, the fastest regiments still stayed out of range of the deadly organ gun. 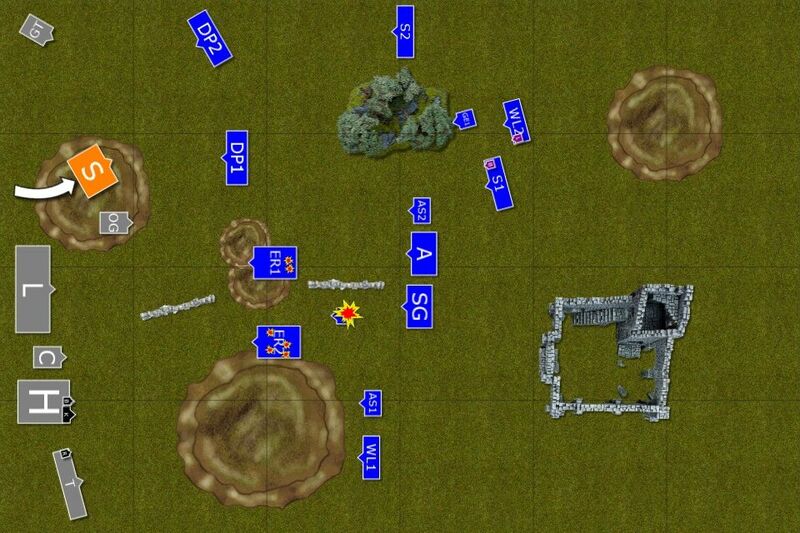 The faster cavalry moved so that they threatened gyrocopter hiding behind the forest while following infantry denied good landing zones for it. 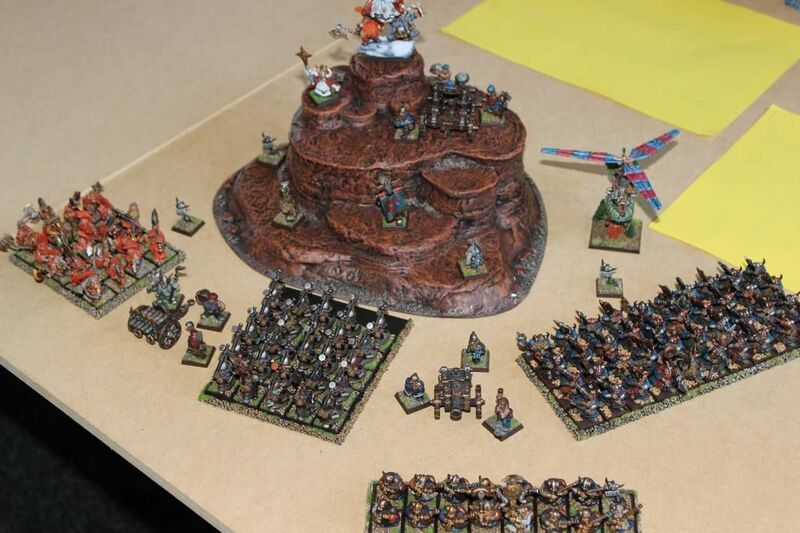 Dwarven army was immovable as a mountain in their chosen formation. Only gyrocopter moved a little and tried to steam some dragon princes to death but failed. On the other hand, the crew of the grudge thrower managed to reduce elven Eagle Claw bolt thrower to a nice pile of splinters. Elves continued their advance. This time gyrocopter had nowhere to hide and was shot down mercilessly. Larry managed to sneak in an Iceshard Blizzard on the Organ Gun crew. Would it be enough to stop infernal machine? With some more threatening approach by elven cavalry, Dwarves finally started to treat them more seriously. The first to drop was great eagle though. Then thunderers aimed at the reavers and only a single rider remained alive after the salvo. His companions from the second unit were also hit but were in much better shape. Only Organ Gun was strangely silent. Finally Slayers moved towards elven knights, shouting insults and daring them to charge. Elven cavalry charges! Dragon Princes attack the isolated grudge thrower and made a short work of the crew. Reavers attack Organ Gun and surprisingly, the crew breaks. Two war machines destroyed! Then Larry the Loremaster, always happy to play with fireworks, casts a nice fireball at a cannon, frying two of the crew members. And a few white lions with a spectacular magical feedback. After unexpected victory over organ gun, reavers where now in the open and nearby Longbeards charged to punish the elves for such a barbarous act. Elven light cavalry swiftly reformed and feigned flight. Slayers too attempted to catch them but also failed. Slayers suffer casualties but don't care - this is their time to seek glorious death! 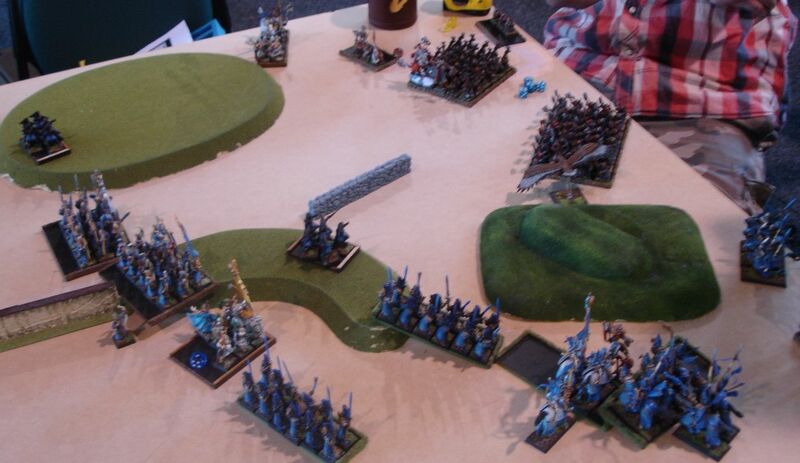 Dragon Princes charge the Slayers from two directions and kill quite a few but their companions don't move an inch. Brutal war of attrition starts. 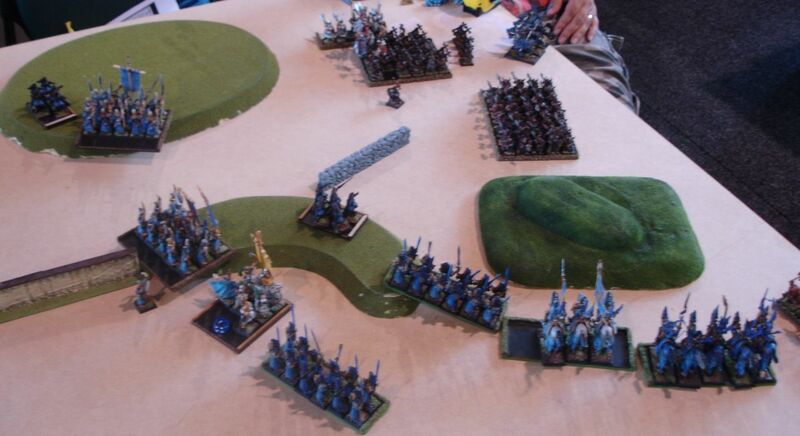 The rest of the elven army approaches carefully, not to get too close to Dwarven main blocks. 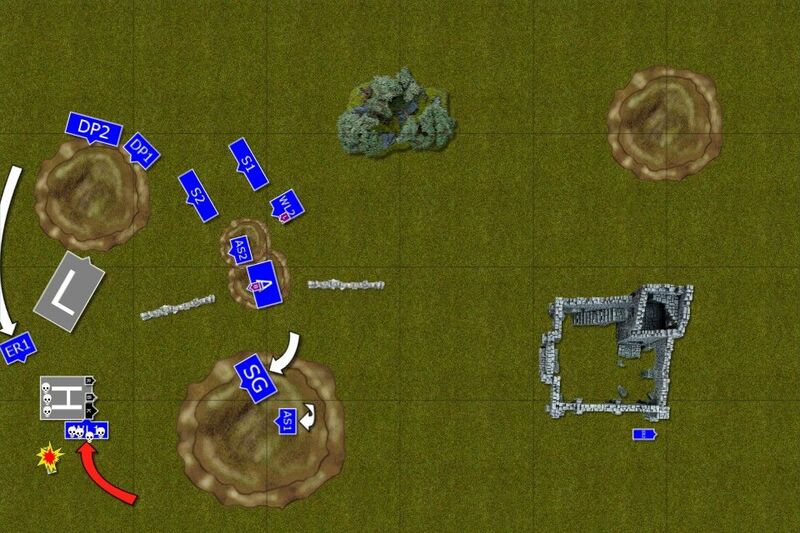 The cannon is finally destroyed but also Thunderers take the brunt of the various missile attacks. Dwarven main regiments didn't move forward knowing all too well that exposing flanks and abandoning defensive positions means trouble. 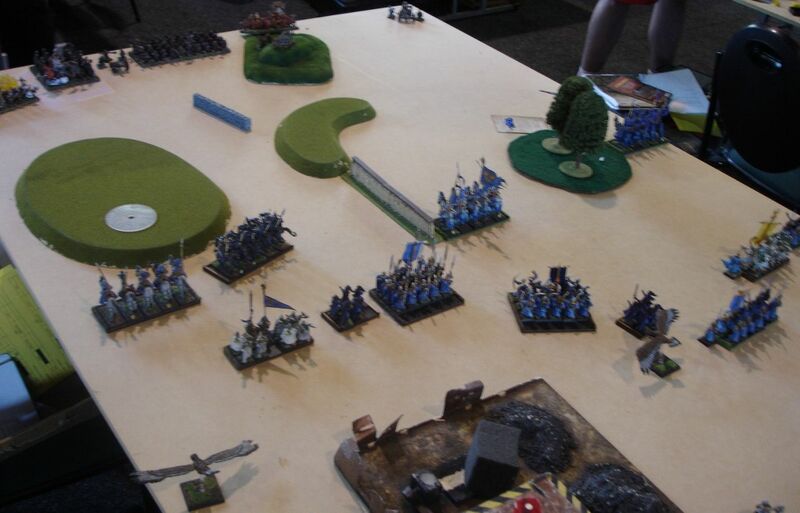 Slayers fought bravely but were no match for elven heavy cavalry. A few still remained though. Elven regiments, not seeing any opening in the tight Dwarven battle line, slow down and let the missiles speak. Thunderers suffer again and Runesmith is escorted towards Hammerers block where his safety could be ensured. There were still few Slayers standing, their smaller number being an advantage when not all of the elven knights could land a blow. Dwarves keep unmovable. 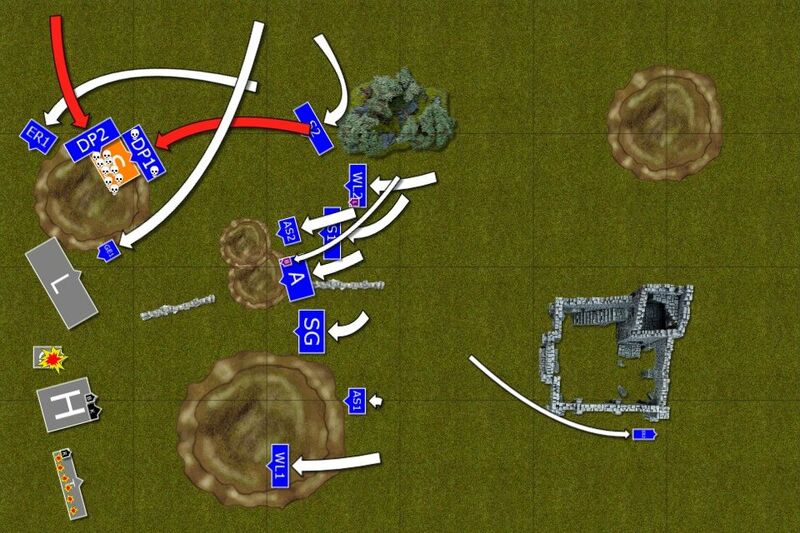 Longbeards charge the eagle and simply reform to the previous position. With almost no shooting left that was all the Dwarves could do apart from waiting for the Elves and letting them decide, to fight or not to fight. The path through the Pass was wide enough for the Outcasts to move through so there was no need for any more blood shed. Elves made sure only that no shooters remained in the Dwarven army so that they could move freely unmolested. 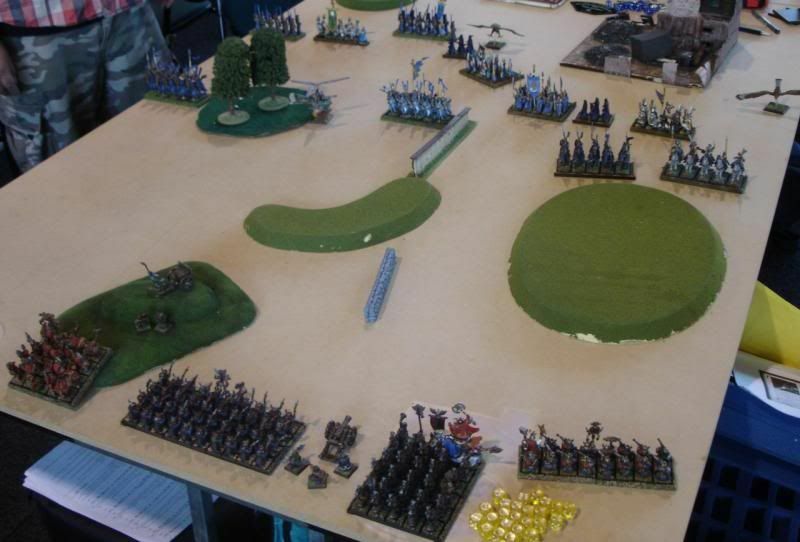 Only regiment of Lions accepted the challenge of the Hammerers and kept them busy for long enough for the rest of the elven force to move safely towards their destination. The objective was achieved, mission accomplished and yet another chapter was added to Dwarven records. I was obviously very happy with the victory as fighting against Dwarves is never easy, even more so in the Battle for the Pass. It was even sweeter to do so with very little casualties! On top of that I received a bonus due to Swedish composition difference and we ended up with 17-3 victory for High Elves! I must admit that Jason made some mistakes that allowed for my victory or made it a bigger one. First of all his war machines were too exposed. Organ Gun was too close and Grudge Thrower was too isolated to survive long. The fact the Iceshard Blizzard made the Organ Gun silent for one turn only emphasised that. Dwarven formation does not have to be so static either. 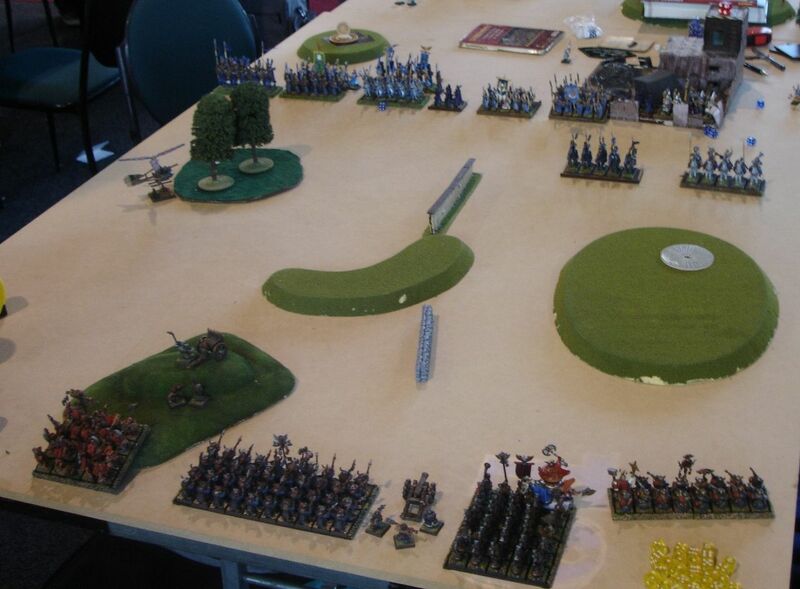 Both Thunderers and Hammerers could move forward more decisively as their flank was nicely protected. 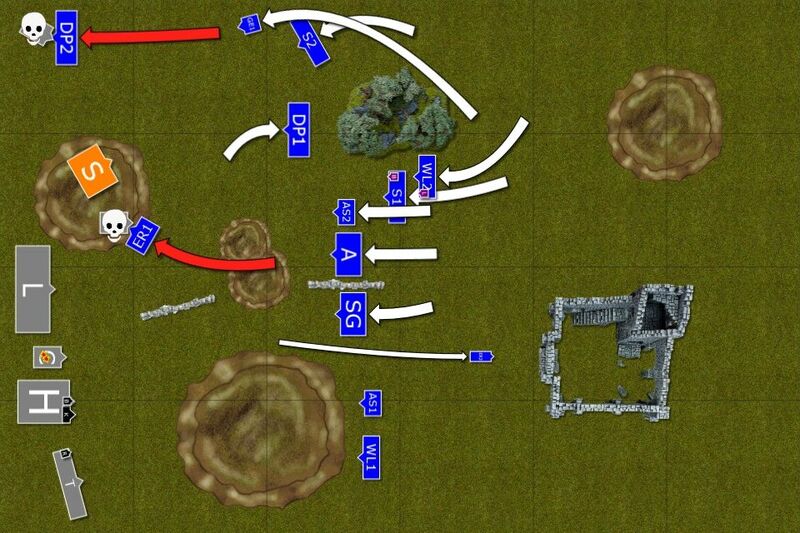 The advantage of the narrower frontage of the battle for the pass. 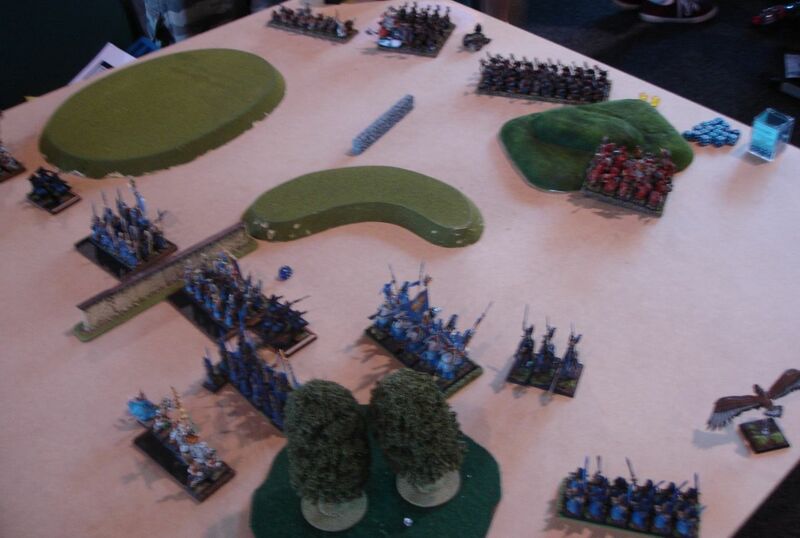 On the other hand Slayers blocked the flank for long enough to stop my units from outflanking the army. 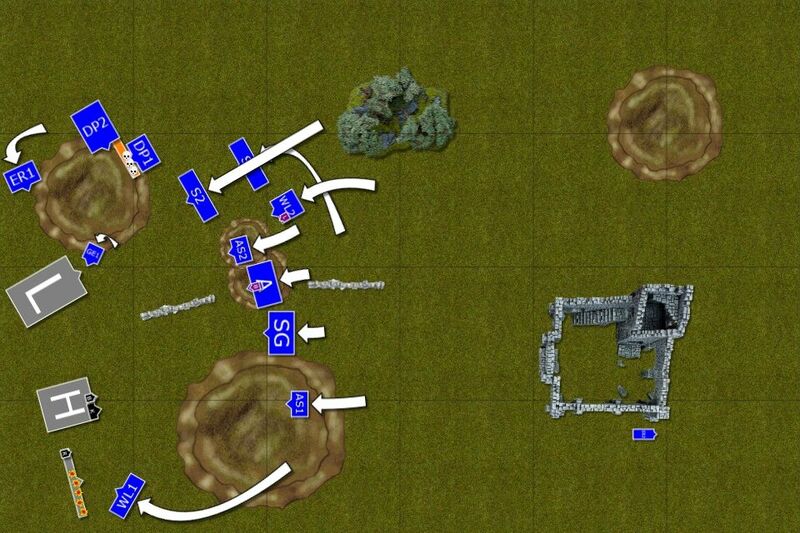 Combined with slower than required approach of the infantry and I was in no position to even think about any attack. I am sure I could have played better as it is possible to reach Dwarven lines in 3 turns but I simply didn't move coherently enough to make it happen. Narrower deployment didn't help and played a role in that but while it explains a lot it is not an excuse! Still need to work on the way I should approach defensively playing opponent. Last but not least I wanted to mention that Larry had a few miscasts this game (3 or 4) that allowed me to get some spells through. Apart from occasional fireworks and eventual loss of the magic levels, he did well as he helped destroying the cannon and thunderers and in the end survived the battle! I hope you enjoyed the game that featured my last encounter with Dwarves of old!